you buy your tickets from the race track itself. a ticket broker or an intermediary such as Stubhub. 1. Send money but receive no tickets. 3. Get robbed by someone meeting you for an exchange. e-commerce safe zones to avoid robbery. 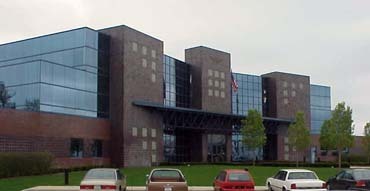 HEADQUARTERS: 50 N Alabama St. DOWNTOWN: 39 W Jackson Pl. NORTH: 3120 E 30th St. These areas are under 24-hour video surveillance. * Meet in a public place. * Meet during the day. KNOW WHAT THE TICKETS LOOK LIKE. You can check this Web Site's Ticket Photo page or check out the photos of tickets for sale on eBay. CHECK A SEATING CHART AND MAKE SURE THE SEATS EVEN EXIST. Say "No" to any strange convoluted requests. DO NOT PAY FOR TICKETS BEFORE THE SPEEDWAY HAS EVEN MAILED THEM OUT. 1. Prove the seller actually possess the tickets. * Have them e-mail you a complete photo of the ticket(s). * Have them e-mail you a photo taken from those seats. 2. Find out the persons name, address and phone number. shoulder the entire burden of trust. For some reason, this expectation has become common in the internet age. "Certified Mail". The buyer can then insure he is getting the tickets before paying. you are likely to encounter. * Parts of the ticket are glossy - have a metallic sheen. * They are printed on both sides. * They may have small cut-outs. * They may have raised reliefs. like. I display photos of the tickets on my TICKET PHOTOS page. You could search eBay for 'tickets for sale' and see photos there too. 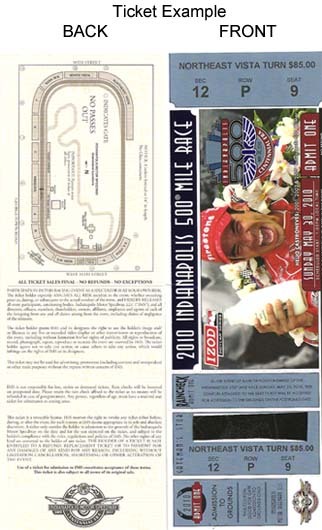 All of the Indy Speedway's seating tickets are physical, large tickets. They do not sell small race day tickets, nor send out e-tickets. that they don't get bent. envelope "Certified Mail" to the buyer. tickets before giving up and returning the tickets to him. back ASAP so that he has time to try and sell them again. 2) The post man delivers the tickets to the door of the buyer. What if time is running out? The buyer can send money instantly and safely with Paypal. The seller can have the tickets sent 'over-night' delivery, which is a bit expensive. a. the Speedway Ticket Office. b. the scalpers standing along the sidewalks out the speedway. CERTIFIED MAIL = Care Of Delivery = C.O.D. would then be out $10 and some time. The buyer examines the tickets and pays the postman. The postman accepts cash, money orders and personal checks. signed when they mailed it. buyer's work address if no one is home during the day. This method should be safe for both buyer and seller.